Learning to paint with oil is a world of it’s own. Oil painting allows for many more possibilities than any other technique. In this course we wish to build an understanding for these qualities and possibilities. As a student you will on the one hand, learn how to use your eyes and observe form, light, shadow and colour, but just as important is the sensitivity to using the paint with different consistencies, brushes, movements over the canvas. This course teaches a naturalistic way to represent the world. We will study paintings by Velasquez, Rembrandt, Courbet, among others. These artists have a strong sense of form and chiaroscuro (the use of light and shadow), a natural pallette of colours and an effortless use of brushstrokes. Therefore we consider them some of the most important references for learning how to paint. (In later courses we will study techniques and attitudes towards painting in art from the 1850’s forward). We very much appreciate the silence and calm that Cerdeira has to offer. It is not without reason that this course is held in a village surrounded by forest and mountain with few distractions. The view of the valley, the changing light and the rich visual world of textures and colours will inspire our learning. We will be working in the studio, looking at still lives and things we find in nature. We will also work outside and do oil sketches of trees and landscape. It is important to underline that the course is for beginners, so if you have never painted before, you will be shown everything you need to get started. We are two teachers present and each student will have plenty of individual support. Many students choose to take our courses repeatedly and the feedback we get is that they are always exciting and new, even for those with some experience. 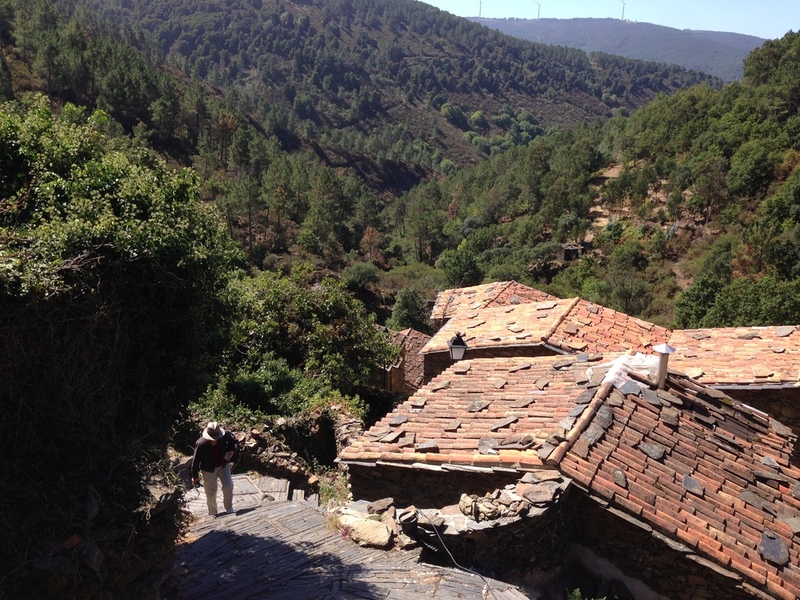 We are going to stay in Cerdeira Arts and Crafts Village. This is a small village that has been restored stone by stone according to it’s original materials and techniques, but with all the modern comforts. It is run by Kerstin Thomas, a sculptor who is dedicated to organising courses, residencies and festivals for artists and craftsmen from all over the world. Some of the houses are run as a Bread and Breakfast and two large buildings are converted into studios. Therefore we will both live and work in Cerdeira. The group will have dedicated studio spaces and access all around the clock. All the houses are heated and have modern kitchens and bathrooms. The village is isolated in the mountains surrounded by forest, but the nearest city, Lousã, is only eleven kilometres away. There are paths up the mountain and through the valley to the nearest village, Candal. Those who wish can go for hikes. Please note that the terrain is hilly and the village itself lays on a steep slope so bring practical shoes. Spring in Portugal is very mild and we can expect fifteen degrees or warmer. Wet on wet: simple oil sketches in full colour. Bodil has 10 years of experience teaching painting. She teaches a program that was developed and taught at the Lorenzo de’ Medici Institute in Firenze. Price for the workshop: 445 euros (non-refundable); this includes course, welcome lunch and studio rent. We only accept signups for the full five days. Accommodation and meals are not included in the course price. Accommodation and meals are to be arranged directly with Cerdeira Village upon signup. First installment of 200 euros to be paid upon signup. Remaining value up until the first day of the workshop. Starts on Wednesday the 20th of April at 12:00PM. Ends on Sunday the 24th of April at 4:30PM. Participants must travel to Cerdeira by their own means. It is an 11 km ride from Lousã, Portugal. The village offers modern restored houses (limited to availability), with fully equipped kitchens for meals (email: reservas@cerdeiravillage.com). Besides the houses it is still possible to sleep in the village in bunkbeds for 18 euros a night. You can otherwise choose to rent a hotel or B&B in for example Lousã, Miranda do Corvo or Candal. Cooked group meals are available upon request. Upon signup you will receive a list of art materials to bring and other important details.